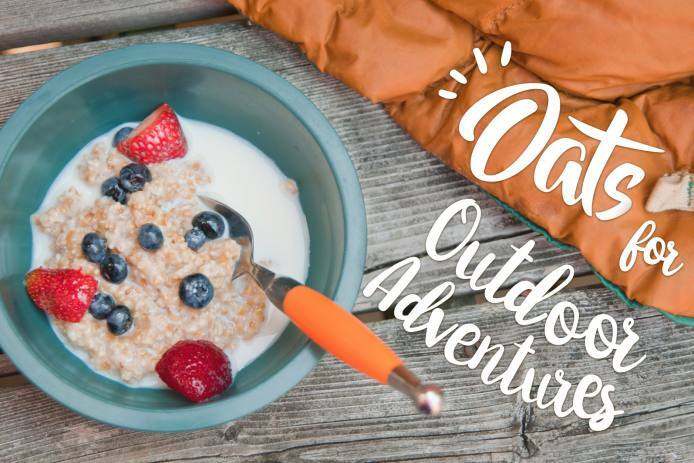 Whether you’re a camper or a glamper, a backpacker or a bike tripper, oats are the perfect take-along food. 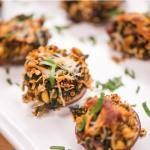 They’re super-light, crushable, easy to prepare and don’t take up much space or require refrigeration. If you can boil water, you can have a hot, hearty breakfast in minutes. Now, you could pick up a box of instant oatmeal packets in the cereal aisle, but our homemade version of instant oats has a few advantages. First, you can completely customize your packets by adding all your favorite things. When was the last time you saw hazelnut-banana-cocoa oatmeal at the grocery store? You can also control (or eliminate) the amount of added sugar and include ingredients to boost the nutrition of your breakfast – like milk powder to complete the protein, or dried berries to help the body absorb more iron from the oats. Here’s the endlessly-customizable formula for Oats-on-the-Go Oatmeal Packets. Use this as a jumping-off point and customize to your heart’s content. This amount makes ONE packet. We find that the snack size zip-top bags are the ideal size for single-serve oatmeal packets. Set up your ingredients and make several packets all at once, assembly-line style. Once you have assembled, sealed and labelled your packets store them all together in a large zip-top bag or sturdy container. For young kids, reduce the amount of oats to 1/3 cup and scale-back the add-ins proportionally. To prepare your oatmeal: empty a single packet into a mug or bowl, add 1 cup boiling water (for the kids’ portion size, use 2/3 cup water), stir and let stand (covered) for 5 minutes. Stir again and enjoy a delicious breakfast on your outdoor adventure! In our version of this favorite Louisiana dish, steel cut oats stand-in for the traditional rice. 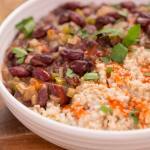 Start your oats right before you begin preparing your beans. 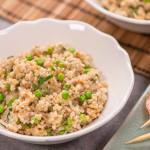 Steel cut oats take the place of Arborio rice in this creamy risotto-inspired dish. It’s actually less hands on than traditional risotto. For a different taste, try pecorino or Romano cheese in place of the parmesan. This is called “Our Favorite” cake for a reason. 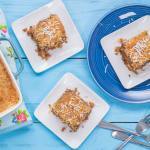 Super-moist, cinnamon-scented oatmeal cake is topped with a sweet brown sugar and coconut topping, broiled in the oven to give an addictive crunch. 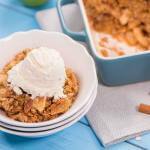 Apple Crisp is the quintessential dessert of fall. Sweet, tender apples are topped by an irresistibly crunchy nut and oat topping. Serve warm or at room temperature.